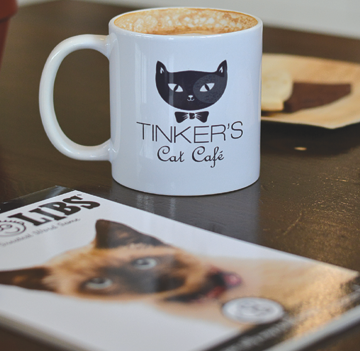 After launching a successful Kickstarter campaign in 2016, Lisa Boone opened Tinker’s Cat Café in November 2017. 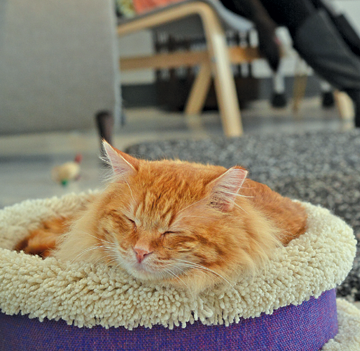 The first of its kind in Salt Lake City, this cat café is located in a former violin shop along the burgeoning 900 South corridor near Liberty Park. It’s the purr-fect place to enjoy the company of friendly felines alongside a warm beverage and pastry. The building houses a regular café on its west side, which serves local Rimini coffee and tea drinks with cat-pun names, like catpuccino and camomeow tea. Cookies decorated with cats from Les Madeleines and vegan treats from City Cakes fill the pastry case. Food is made outside of Tinker’s Cat Café and is kept separate from Tinker’s Cat Lounge. Purr-use the stuff for sale like catnip joints and hand-knitted beanies with cat ears. Cat-themed art decorates the walls, and there are a few tables where you can drink coffee and eat a lemon bar before hanging out with the cats. A wall that separates the café from the cat lounge on the east side, where the cat magic happens. To enter, you need to make an advance reservation and pay the $8 hourly fee (children 10 and under pay $6), which allows you to spend time with Madame Bovary, the cafe’s resident cat, as well as 10 to 14 adoptable cats from Salt Lake County Animal Services. 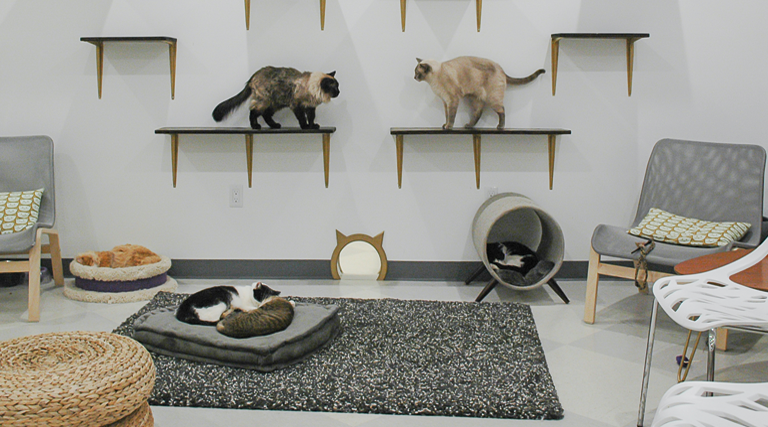 The cat room is pawsh—decorated like an Ikea for cats—with a wall of shelves for climbing, a tall cat tree and other comfy kitty features. Huge windows give the cats a view of the world and let in natural light. Plus, it delights the humans who can watch the kitty fun from the sidewalk.